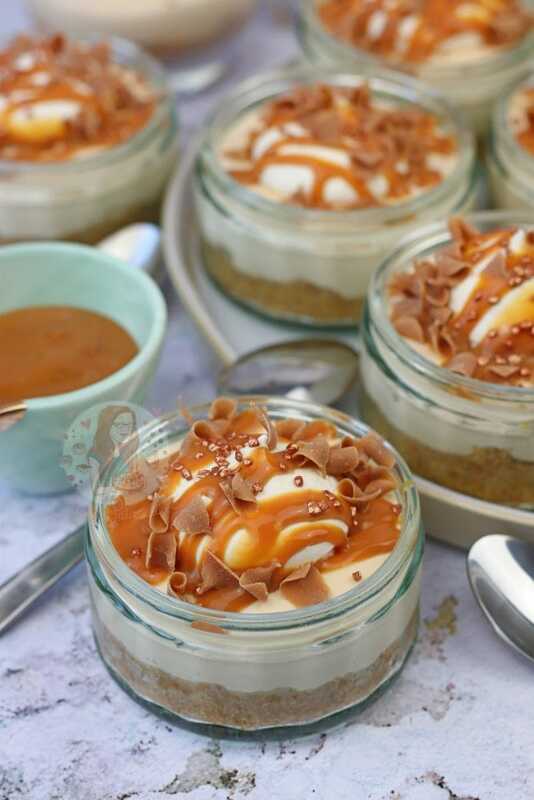 Individual Salted Caramel Cheesecake Pots with a Buttery Biscuit Base, Whipped Cream, and Caramel Drizzle! I’m probably one of the worlds biggest Cheesecake fans, and I couldn’t resist posting yet another one onto this blog of mine. I realise that not everyone loves cheesecake, but a very large percentage of you love them just as much as I do! Good news, because I won’t be stopping posting them any time soon. 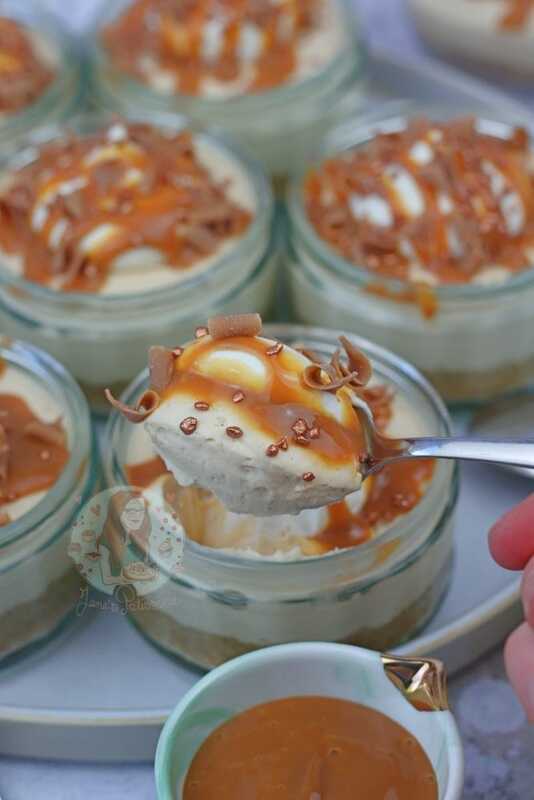 Anyway, as all the cheesecakes I do tend to be full size ones, I thought I would go down a slightly different route and take inspiration from my No-Bake Lemon Cheesecakes as they’ve been quite popular on my blog recently, and do something similar. Another recipe to be quite popular these days is my No-Bake Salted Caramel Cheesecake, so it seem obvious to choose this flavour. 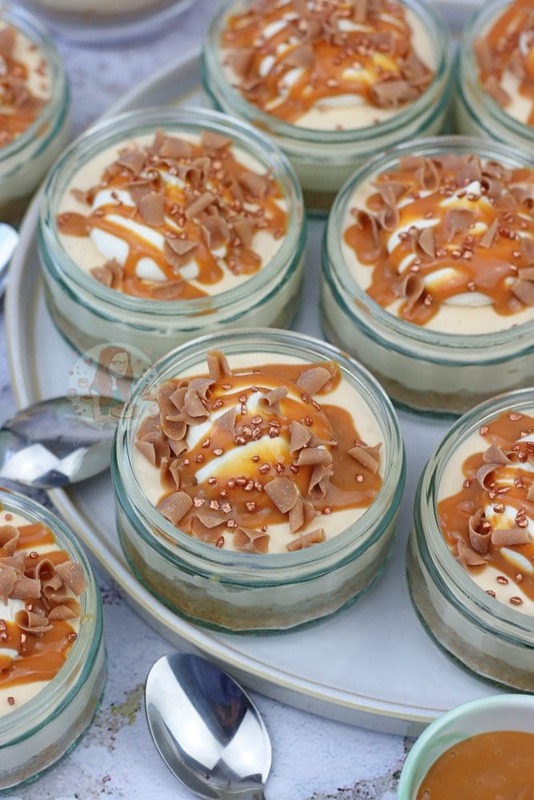 I realise that you can just use the No-Bake Salted Caramel Cheesecake recipe to make your own individual ones, but when I make these individual ones I do make them slightly differently to the full size type. As my Homemade Caramel Sauce has been a hit since posting, I wanted to use some of it to make this recipe, but it had actually all disappeared. I got in the habit of eating it with various treats, and I had some Carnations Caramel lying round… soooo i used that. But Homemade Caramel Sauce would work SO well. 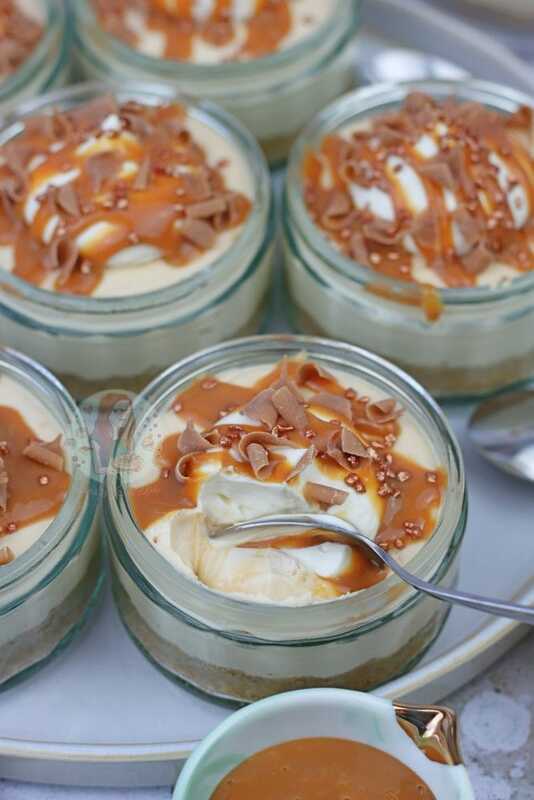 The good thing about making a dessert into individual pots such as the Gü ramekins I used, or glasses for example, is that you can make them slightly lower fat if you wanted. You shouldn’t use the lowest fat cream cheese to exist, and single cream, as that would be too thin… but you can use lower fat cream cheese and double cream for example, or full fat cream cheese and single cream. For these particular ones, I used half full fat cream cheese, and half low fat cream cheese, with double cream. It made the texture perfect. Using slightly less butter in the base made it easier to eat in the jar as its slightly more crumbly, and technically its less fatty that way as well. Obviously, these changes aren’t essential, but I know some of you would love this info. The important part of the ‘Salted’ part of the caramel is to use the right salt. 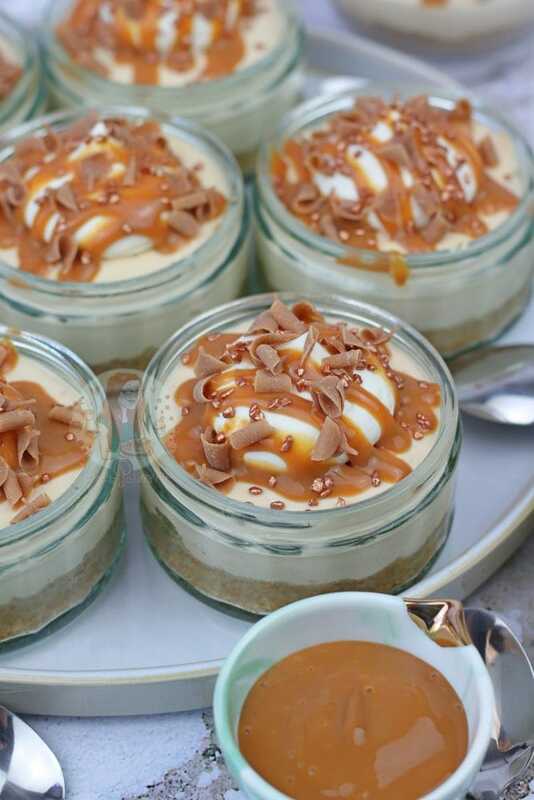 I’ve said this in other recipes such as my No-Bake Salted Caramel Cheesecake, because it really is important. I use Maldon Sea Salt because its chunky, and it has a lovely taste. Therefore, I use 2tsps of it. However, you can’t simply substitute it for 2tsps of table salt. That type of salt is much stronger, and might give it a funny taste… so try to use sea salt, and taste as you go if you’re a newbie to Salted Caramel! 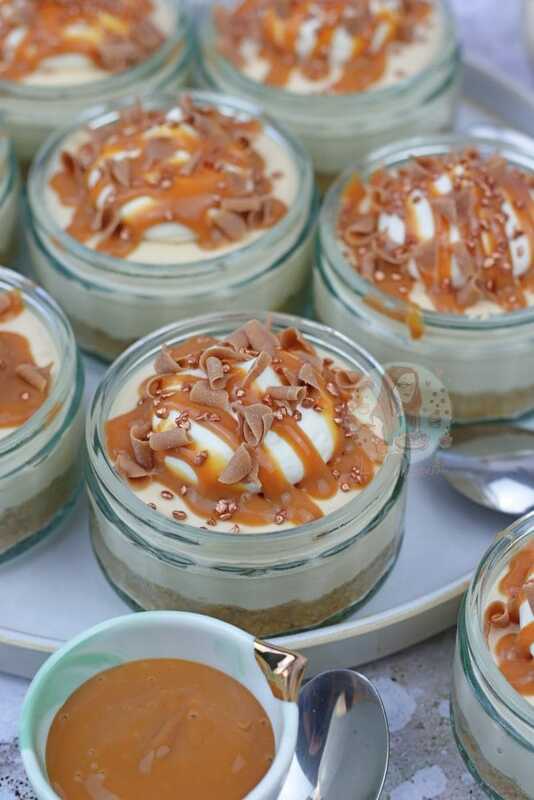 Individual Salted Caramel Cheesecake Pots with a Buttery Biscuit Base, Cream, and Caramel Drizzle! Blitz the biscuits in a food processor and mix the biscuits with the melted butter. Portion between 12 Ramekins/Glasses and then press down relatively firmly. Using an electric mixer, I use my KitchenAid with the whisk attachment, whisk together the Cream Cheese, Vanilla, and Icing Sugar until smooth. 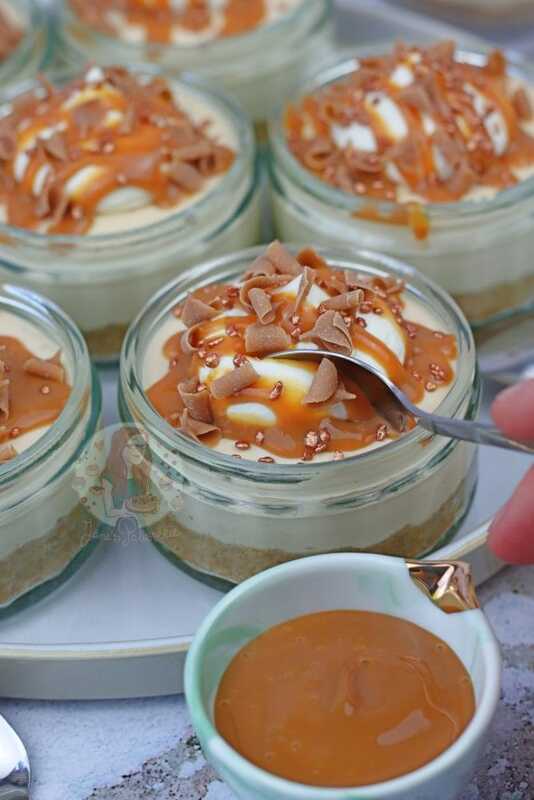 Add the Caramel and whisk again until smooth and lump free – this could take a couple of minutes, I whisk it at half speed so not too quick or slow! Pour in the Double Cream and the salt, and whisk again till smooth. As these are individual desserts, that are in dishes, it doesn't have to be that thick. It just has to be combined and lump free. Pour/Spoon the Mixture between the 12 Cheesecakes and smooth over. Set the Cheesecakes in the fridge for 1-2 hours. Whip up the Double Cream and Icing Sugar until thick. Pipe onto your cheesecakes. Drizzle over some extra Caramel, and sprinkle over some sprinkles! Enjoy! 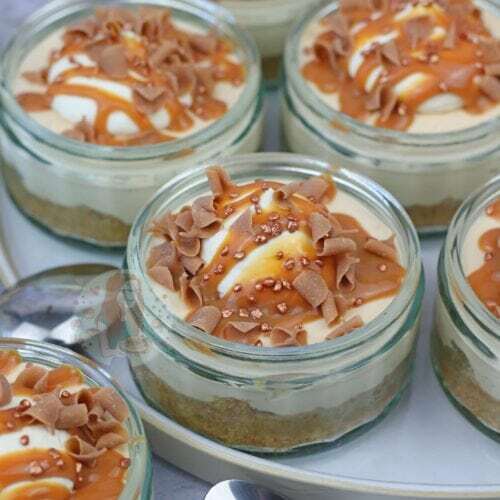 As these cheesecakes are in ramekins or glasses as you can see in the pictures, its actually easier if the cheesecake isn't as thick as a regular No-Bake Cheesecake such as my No-Bake Salted Caramel Cheesecake. I use less butter in the base of these as its easier to eat out of the jar that way. I used Carnations Caramel to make these, or my Homemade Caramel Sauce. 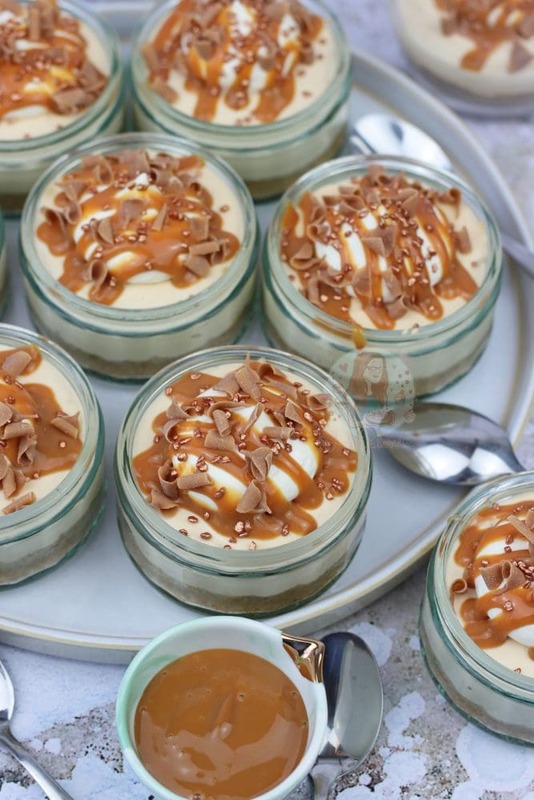 I used some Gü pots that I have had for a while from eating their desserts - they're the perfect size! These will last in the fridge for 3 days once made. As these are made in the ramekins/glasses, you can use lower fat cream cheese - but be careful it doesn't split when mixing. 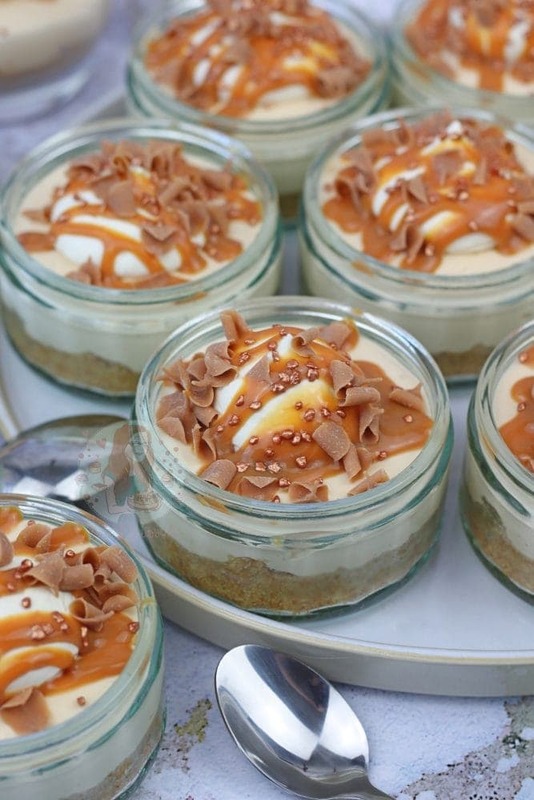 Find my other Caramel & Cheesecake Recipes on my Recipes Page! Older Next post: Toblerone Rocky Road! Newer Previous post: No-Bake Summer Berry Cheesecake! I made these earlier this week, I swapped out the regular digestive biscuits for gluten-free digestive biscuits (my partners parents are GF) and these were absolutely delicious!! All given 10/10 reviews, thanks so much Jane!